Home > aktualności > The oldest in the collection! The oldest in the collection! Our Museum’s newest acquisition is a real rarity: a Gothic salt cellar, dating back to 1500. That means it is the oldest, and at the same time one of the most valuable exhibits in the museum collection. 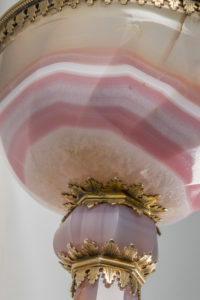 Its characteristic feature is the use of a decorative stone – agate. Decorative, colourful and semi-transparent stripes, visible in the structure of the stone, have been perfectly brought out by the shape of the vessel, whose intended uses were both to carry salt and be the object of admiration. In the Middle Ages, such luxurious items, showing the power and affluence of their owners, sometimes happened to be made from gold, seashells, coconut, rock crystal, amethyst, serpentine, jasper and other rare materials. The agate used is known to have come from the Idar-Oberstein region in south-western Germany, a widely-known rock mining and dressing centre. The salt cellar with a decorative microsection was re-assembled in the 16th c. when silver and gold-plated mounting elements were added, including an intricate belt with twisted leaves around the base. The museum collection of salt cellars is ranked as one of the most valuable selection of this sort in the world.